Maple syrup isn't just for pancakes. 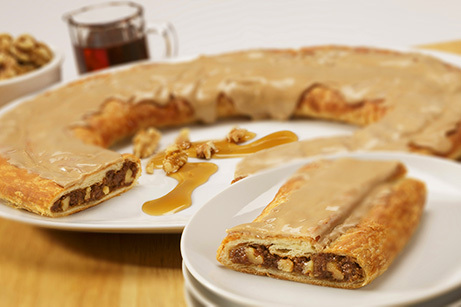 We put a sweet spin on our Walnut Kringle and paired it with a delightful maple flavored icing. 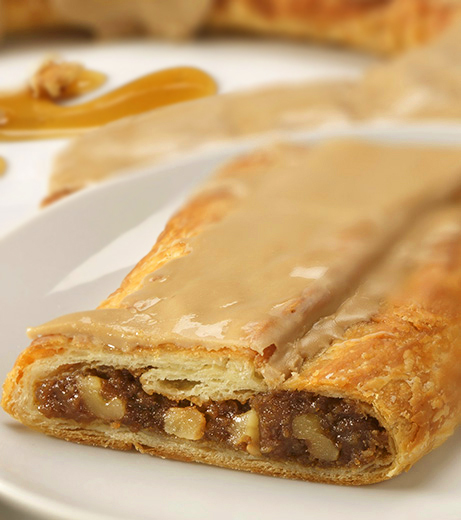 Together, the maple icing and golden walnuts make this classic Kringle a bit more special. Contains Egg, Milk, Soy, Wheat, Walnuts. May contain traces of tree nuts (almonds, macadamia nuts, pecans, coconut) and peanuts. Wheat flour, margarine (interesterified soybean oil, water, salt, mono- and diglycerides, colored with annatto/turmeric. Calcium disodium edta added as a preservative. Artificial butter flavor. Vitamin a palmitate added. ), brown sugar (sugar, molasses, cane syrup), sugar, walnuts, 2% or less of the following: water, corn syrup, eggs, yeast, soy lecithin, soy protein, salt, dextrose, calcium carbonate, maltodextrin, fenugreek extract, sorbitol, coffee, cinnamon, agar-agar, tocopherols preservative, citric acid, soy flour, canola oil, calcium propionate, natural & artificial flavors, malted barley, corn starch, color added.